Clown wigs can be made for a Halloween costume or for a child’s party or dress-up box. Use one color or many colors depending on the look you need. 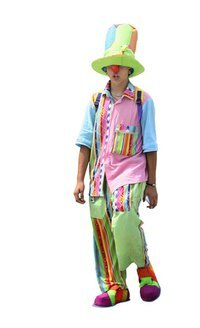 A geometric black and white clown suit may call for a clown wig that is made with sections of just black and white, while a colorful clown costume would look best with a wig of several different colors mixed together. Making your own clown wig gives you control over the length of the hair and the colors used. Cut the label off the top of the mesh bag. Keep the bag intact by not cutting all the way through the stitching. If the bag comes undone, stitch it back together before beginning. Roll up the edges to make a hat. Place on your head to fit. Be sure not to make it too small. It should look like a mesh ski cap. Let it cover the back of your head and at least down to the middle of your ears. Cut the cardboard to the length you want the strands of your wig. Wrap the yarn around the cardboard several times. Make one straight cut to remove the yarn. This will separate the yarn into strands twice as long as the final wig hair. Latch hook the first row of yarn around the cuff. Press the latch hook through the folded cuff of the mesh bag to secure the folds of the cap. Use the latch hook to tie the yarn onto the mesh. Latch hook by folding a piece of yarn in half, hooking it with the latch hook tool and then pushing it through a mesh hole. Pull the hook back down to finish. Attach the strands of yarn by latch hooking a row at a time. Fill all the mesh holes to complete your wig. Attach a thin length of elastic to each side of the wig. Tie one end of a piece of elastic to the mesh on one side and then tie the other to the opposite side. This will create a chin strap. Alternately, a piece of elastic can be weaved through the cuff of the wig for a better fitting clown wig. Leave the yarn as is, trim to shape or unravel each strand of yarn to make a curly wig. Bows can be tied in the wig, or affix a small hat to the top. Try heavy-weight rug yarn to create a thicker wig.